Vanderbilt styling as pioneered by Christian Herter in the late 19th century sees cosmopolitan interiors decorated eclectically to communicate discerning, cultured tastes and luxurious fabrics and finishes. These interiors are then punctuated by objets and artworks from celebrated artisans and fine artists. 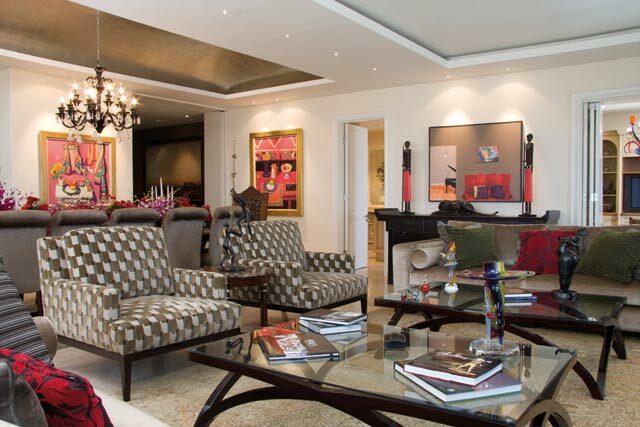 In this interior, designer Lynne Blumberg adapted this fine tradition for her clients’ Joburg home away from home. For an actress reaching for the stars, what could be a more fitting place of abode than the glamour of a penthouse pad? Having left the family nest at the age of 18 in pursuit of stardom abroad, high aspirations seem to be par for the course for successful local actress Lee-Anne Summers. It was with the same characteristic tenacity and purpose that Lee-Anne embarked upon creating a stylish apartment for her family high above the clamour and glitz of Sandton. Above: Cascading down over five metres, the imported copper chandelier makes an arresting feature in the stairwell and entrance hall. Deep, comfy, modular seating on the balcony means that entertaining outside is an informal, though lush, affair. of shops, restaurants and places of entertainment right on our doorstep.’ And if that wasn’t enough, dare we mention the exceptional gym and spa facilities? The Summers family placed the design and décor of their previous Sandhurst home under the highly capable aesthetic direction of interior designer Lynne Blumberg. They therefore had no doubt in her ability to create, for a second time, a home that would meet their vision and needs. The brief was short and uncomplicated. ‘My clients wanted a space that would evoke a stylish, New York penthouse feel with a touch of Hollywood glam.’ Inspired by the grandeur of New York’s Fifth Avenue mansions, Lynne set out to capture the elegance of the Vanderbilt style, but with a relaxed and comfortable approach. In terms of layout, the family wanted a modern and uncluttered feel. 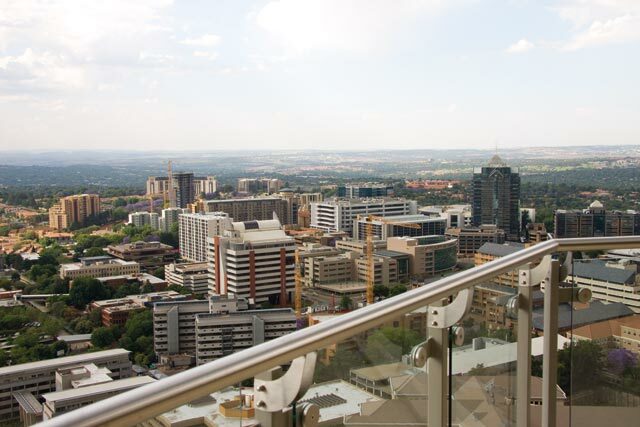 Above: The dynamic skyline and breathtaking views over Sandton. The advantage of buying the penthouse off plan was that creative considerations proved boundless. With an entire team in tow, from architect to metalworker, Lynne met with the family on-site every Friday through the course of the project. In addition to the layout, every design aspect (from the lighting to the smallest fixture) was decided upon during these meetings. Having to scale 27 flights of stairs during construction proved no mean feat and was testament to Lynne’s commitment to fulfilling the authenticity of her clients’ brief. Lynne is deeply aware of the importance of lighting in a home, not only from the practical function it performs but also its decorative role. From the sinuous, copper light-fitting snaking its way down the stairwell, to the modern LED downlighters illuminating the quartz bar counter, it is evident that the lights throughout have been artfully selected – and to striking effect. Taking a bath in the main bathroom makes for a truly enchanting experience. Small fibre-optic fittings glimmer in a ceiling of celestial splendour. Above, far right: The baby grand piano is digitally programmed to play by itself and instils a jazzy, Stravinsky-era ambiance of New York’s Fifth Avenue. Top, left: The master en suite is a generously proportioned, neutral expanse and conducive to a languid, spa-like experience. top, middle: To create an ultra-luxe bedroom retreat, Lynne worked off a colour scheme of champagne, pewter and plum, combining plush and sheer textures with flocks for graphical emphasis. Above left: The kitchen is a comfortable yet practical space in which to cook and entertain. Overall design aesthetic recalls French Provençal styling, where focus and interest is held by the exquisite Murano chandelier.Far right Since 1981, interior designer Lynne Blumberg has been considered an authority in both corporate and residential design. Lynne is a founding member of the South African Guild of Interior Design (SAGID). Top, middle: Lee-Anne Summers is perhaps best known for her film role in Big Fellas (2007) and her portrayal of Anneke Keppel in the drama series Stellenbosch. For an actress pursuing a career in television productions, Joburg is where it’s all happening. Lee-Anne couldn’t have chosen a better vantage point from the top of her penthouse. ‘The ceiling-height windows that line the walls of the guest bedroom is my favourite feature of the apartment. The view of the northern skyline through them is breathtaking. On a clear day one can even see the outline of the Magaliesberg on the horizon.’ With the world spread below and the stars within reach, who can say the sky is the limit?